While just three blocks wide and five blocks long, Darlington Borough is just 30 minutes from the Pittsburgh International Airport and less than an hour from Downtown Pittsburgh. 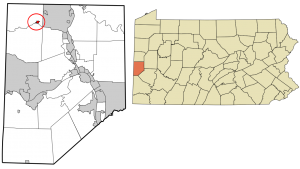 Darlington Borough is located in Northern Beaver County, Western Pennsylvania and is part of the Blackhawk School District. Darlington has easy access to PA Route 376, the Pennsylvania Turnpike and Route 51. The Borough is home to numerous historical attractions, including Greersburg Academy and Little Beaver Museum. Darlington is minutes from Air Heritage Museum, Brady's Run Park, the Beaver County Industrial Museum and many other attractions.